It's been a long several weeks. I needed a giggle...a laugh...maybe even a snort. So, I checked out some of my favorite "time-wastin" sites. Have you visited People of WalMart? No? Then you must, must go right now. Just be sure you don't have any where to go for the next hour or so. 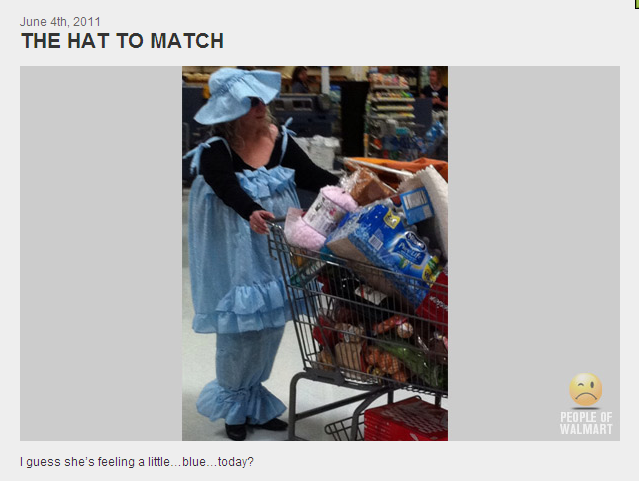 If photos aren't funny enough, someone actually wrote a song and made a video celebrating the people of Wally World. Check it out. This next one is definitely PG-13...maybe even R, so I apologize now. But, Texts from Last Night is hysterical! And the last one I'll share is Passive-Aggressive Notes. My favorites on there are the notes in the workplace. What are some websites that you go to when you just need to clear your brain for a few minutes? Are they funny? Inspirational? Educational? I have seen the Walmart one but none of the others - damn so much for clean underwear for everyone tmw. I am sitting right here in my pajamas and checking these out! Have you been to awkwardfamilyphotos.com? And there's the pet version, too.